When designing and building a retaining wall, there are a variety of factors to consider, regardless of whether it’s intended for residential or commercial use. The same standard of care should be applied to walls as a bridge since they are both structures. Depending on the application and your experience, you may wonder what style of wall will work best for the site, how deep the footing needs to be buried, if it needs reinforced, or even what material is best for the location. Before you begin designing your wall and choosing the aesthetics, you need to understand the location and environmental factors that can make your wall fail. Building a retaining wall takes advanced planning and careful layout in order to avoid it becoming a hazard or collapsing. This article looks at some factors that need to be considered early in the design phase along with guidance on choosing the best type of retaining wall for your project. The purpose of all retaining walls is to hold soil behind them. However, the specific needs will vary depending on the project. Walls can range from small landscape stone walls to surround a garden to enormous soil-retaining projects along a highway. Others can help control erosion from hard rains or create a terraced yard to reduce maintenance. When you begin the initial planning, there are several considerations that will affect the material and type of wall you build. Below we look at four of them. If your wall is on a slope, where will you store additional infill that must be brought to the site? Excess soil. If you are cutting into a hillside, where will the excess soil be stored? Natural drainage patterns. Depending on the wall size, a retaining wall can impede on natural drainage patterns and have environmental consequences downstream. If your wall is along the property boundary, will the reinforcement system encroach the property line? Surcharge Loads. Will there be additional weight or vertical forces above the wall such as fencing, guardrails, driveways, parking lots, or swimming pools? Don’t forget about temporary construction equipment. Soil: The soil that creates the foundation, or base, needs to be examined to ensure it meets the strength required to support the wall. You should determine the type, bearing capacity (the capacity of soil to support a load), stress parameters, and friction angle (resistance to movement) of the soil used for the foundation and reinforced zone along with the retained soil zone. In general, the base soil needs to be firm, solid, and strong, and it should not be moist. Wet soils such as clay soil are also not recommended for infilling. They are already saturated with water, so additional moisture cannot make its way through to the drainage channels. Also, in areas where there is freezing, wet soil can expand and contract which will damage the wall. On the other hand, sandy soils allow for good drainage. Consult the geotechnical report which describes the on-site soils, expansive soils, poor chemical properties, groundwater conditions, and more. Design: To begin the design, you must calculate the corresponding wall heights, footprint sizes, slopes, and the setback angle which are dependent on the site elevation and grade. You must also consider that gravity will cause the retained material to naturally move downslope. This should be counteracted within the design to minimize the amount of lateral earth pressure behind the wall, which, at maximum value, can ultimately overturn the wall. Your wall height is dependent on soil and slope, setback, and size of the block. Wall Reinforcement: If gravity alone won’t support your wall, there are reinforcement methods available that depend on the wall type, height, design, friction, angle, soil material, and more. Mechanically stabilized earth (MSE) is soil with some means of artificial reinforcement such as steel or geosynthetics (such as geogrids). Geogrid is often made of a high-tensile fabric woven in to a grid pattern. It is placed in between the layers of retaining wall blocks and rolled back into the earth. Other types of reinforcement include soil nailing, earth anchors, rock bolts, among others. Wall reinforcement can be included as part of a wall system. For instance, Oldcastle Infrastructure, A CRH Company, manufactures MegaWall™ MSE which is a mechanically stabilized earth system meant to retain soil on one side. 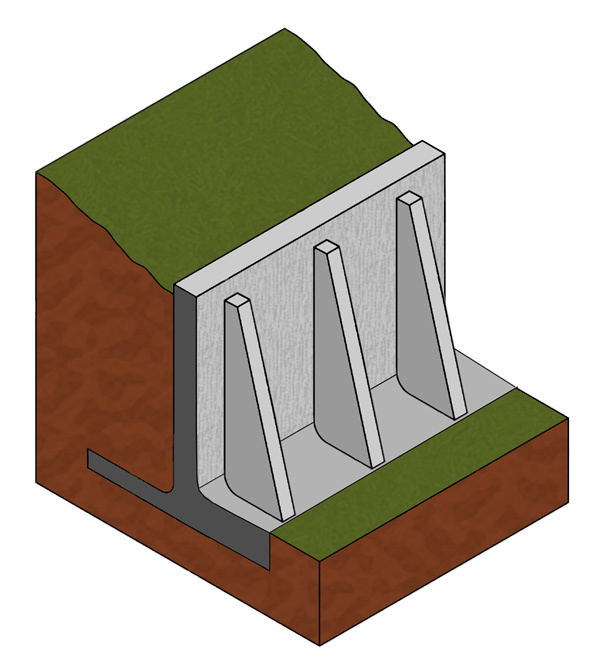 Individual precast concrete block units are connected to Tensar uniaxial geogrids or welded wire mesh for reinforcement. The block units are nearly 14 times bigger than a standard one-square foot block (the largest MegaWall block is 66” x 30” x 16” and over 2,000 pounds). Drainage: Considering that water is the most common reason that retaining walls fail, it’s essential to make sure your wall has good drainage and that there will be no buildup of water behind the wall. Identify potential surface water sources and make sure to drainage adjacent to the wall site has been accounted for. It is important to grade the site for drainage patterns and construct a drainage system behind the wall to minimize the amount of hydrostatic pressure the groundwater could create. An example drainage system could include backfilling with gravel, using drain pipes, and using “weep” holes to allow water to pass through the wall. Larger wall projects, such as those for transportation, should have a hydrology analysis done. 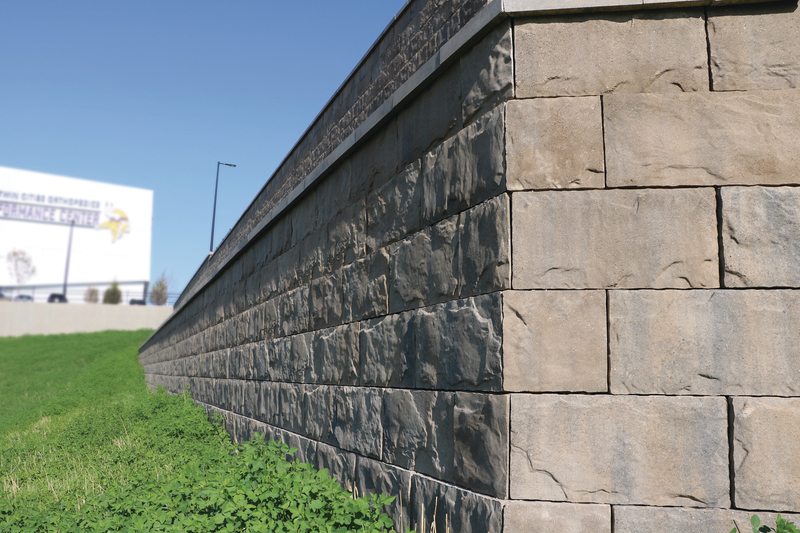 Refer to the NCMA Segmental Retaining Walls Best Practices Guide for a checklist of these considerations and more. After evaluating the location, soil, design, and drainage, you can begin thinking about the type of retaining wall your project will need. There are a multitude of options. If the wall comes as a system, designers should work with the product manufacturer for absorption requirements, strength, height deviations, and more. Also, if needed, the appropriate reinforcement method should be used. 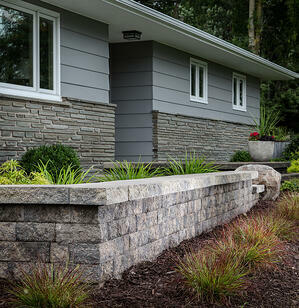 Read on to learn more about these wall types to help you select the right retaining wall for your project. Note: the wall heights are listed for reference only. Uses: Straight or curved walls typically under 4-feet high, but dependent on product specifications. Gravity walls use their own weight to hold the soil behind them and are typically made with heavy materials such as stone, large concrete blocks, or cast-in-place concrete. They lean back toward the soil with interlocking edges and use their mass to resist pressure from behind. Gravity walls can be small (under 4-feet high) or go upwards to ten feet without reinforcement. Municipalities usually require a building permit for walls taller than 4 feet. 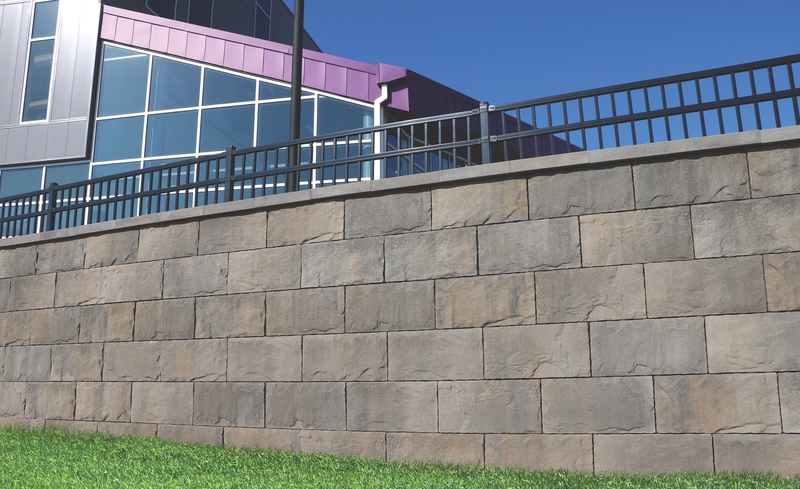 For gravity walls above 4 feet tall and below 10 feet, you can use our Mega-Tandem™ Mass Segmental Retaining Wall System (MSRW) by Belgard that uses connectors that create structural integrity in both curved and straight walls. The face units have twelve textures to choose from and the system comes with jigs to help support the wall during construction­. 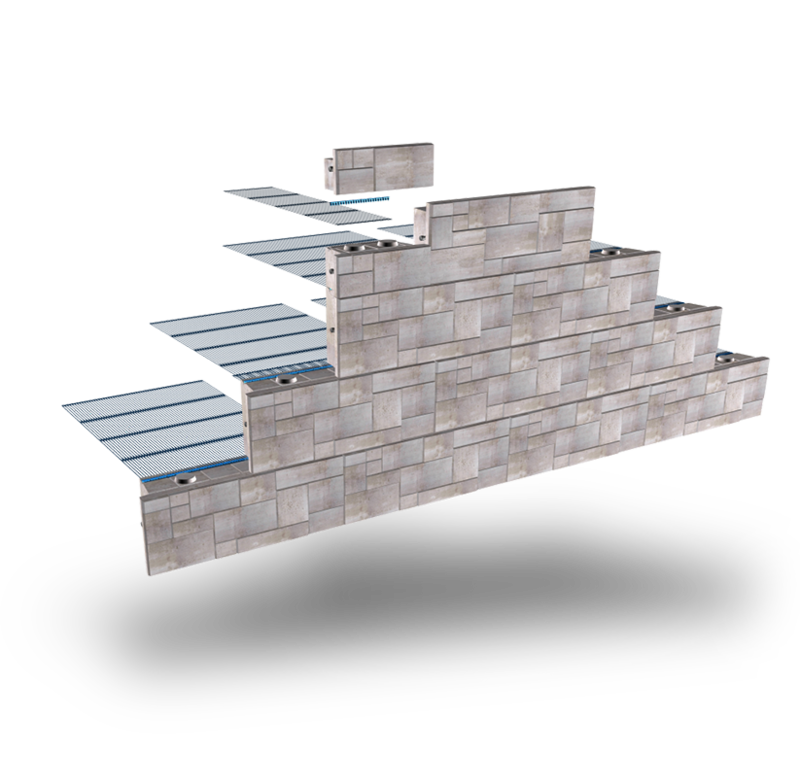 With reinforcement, the Mega-Tandem system can also be used for walls up to 15 feet high. Uses: Various commercial and residential applications, used for both straight or curved designs. They can be designed to conform to any shape while maximizing the site’s usable space, particularly on high-sloped terrains. When reinforced, they typically have no height limitations. Segmental retaining walls (SRWs) are designed to be used as a gravity wall either with or without reinforcement and can have heights in excess of 40’. SRWs are modular blocks made from concrete that are often dry stacked without mortar. The individual units interlock with each other to avoid overturning and sliding. Since they are manufactured in a plant, they meet industry standards and are uniform in weight, strength, and durability. They also come in a variety of colors, sizes, and textures to meet the aesthetic requirements of your project. Some brands offer pins or clips to help create a continuous facing system. 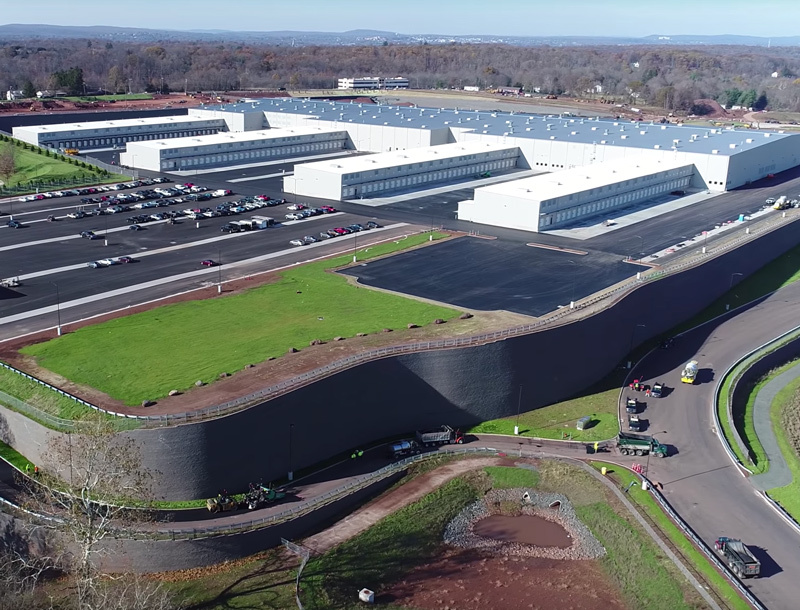 One of the largest and tallest retaining walls in North America is nearing completion at a FedEx Ground Distribution hub in Middletown, Connecticut. With heights of 60 feet and over 310,000 square feet of blocks provided by Anchor Block (part of Oldcastle APG, A CRH Company), the project also called for over 630,000 square yards of geogrid soil reinforcement. (Photo source: eWave Media/Earth Retention Systems). Some manufacturers offer segmental retaining wall systems for when excavation is limited. 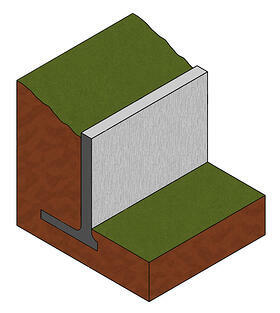 An example of this is the Anchorplex™ retaining wall system developed by Anchor Wall Systems of Oldcastle APG. This cost-effective solution completely eliminates the need for the construction of a mechanically stabilized earth zone behind the wall and requires substantially less excavation than is usually necessary in a grid-reinforced wall. As with the case of this development project in King of Prussia, PA, the Anchorplex system was used because of the limiting 12-feet of space between the wall and the property line. Uses: Deep excavations with heights up to 18 feet. Cantilever retaining walls work on the principles of leverage and are often constructed in the shape of an inverted T with reinforced concrete or mortared masonry. Less building material is required for a cantilevered wall than a gravity wall, and they can be poured on site or manufactured at a precast concrete facility. They consist of a relatively thin stem and a base slab, which is divided into two parts: the heel and toe. The heel is the part of the base under the backfill while the toe is the other part. Rigid concrete footing is required for these walls that are usually under 25’ high. Uses: Tall walls of 20 to 40 feet. Similar to cantilever walls, counterfort walls require support along the backside of the wall. They use concrete webs, also known as counterforts, build at an angle to strengthen the stability of the wall. These webs are located at regular intervals along the length of the wall and reduce the natural pressures put on the wall from the soil while also increasing the weight of the wall. These are preferred over cantilever walls when the wall is taller than 25’. Uses: Temporary deep excavations in tight spaces such as around marine locations, cofferdams, and seawalls, along with structural columns, pier shafts, and more. Sheet pile retaining walls are made out of precast concrete, steel, vinyl, or wood planks and are used in soft soil and tight spaces. The planks are driven into the ground by vibrating and hammering to ensure their stability and can be connected using a groove and tongue. Taller walls require an anchor of some sort that is tied to the wall and then built into the soil. 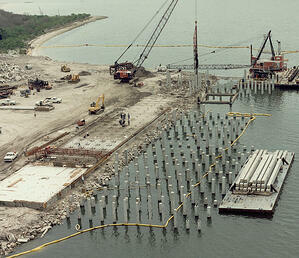 They are good to use along waterfronts and can help with beach erosion, shoring, excavations, or cofferdams. Bored piles are often used when the vibrations from pile drivers are too strong for sheet piles to withstand. Anchors are sometimes needed to support the walls, but not always. Uses: Can be placed in tight spaces with limited right-of-way. You’ll see panel walls utilized in tall applications such as highway ramps, or near areas where there are heavy loads. They can also use posts to connect the panels that are made of precast concrete reinforced with steel. 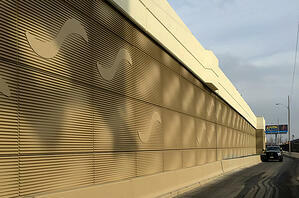 The face panels can be custom designed with various architectural finishes to fit in with the surrounding area. Uses: In stream or water applications where erosion is a concern. Can also be used in military applications to protect against artillery fire or in a modern residential or commercial setting where the wire mesh is filled with a recycled or aesthetically pleasing material. Gabion-style walls use wire mesh boxes are filled with stone and rocks and then stacked together. The boxes are tied with wire and angled back towards the slope. 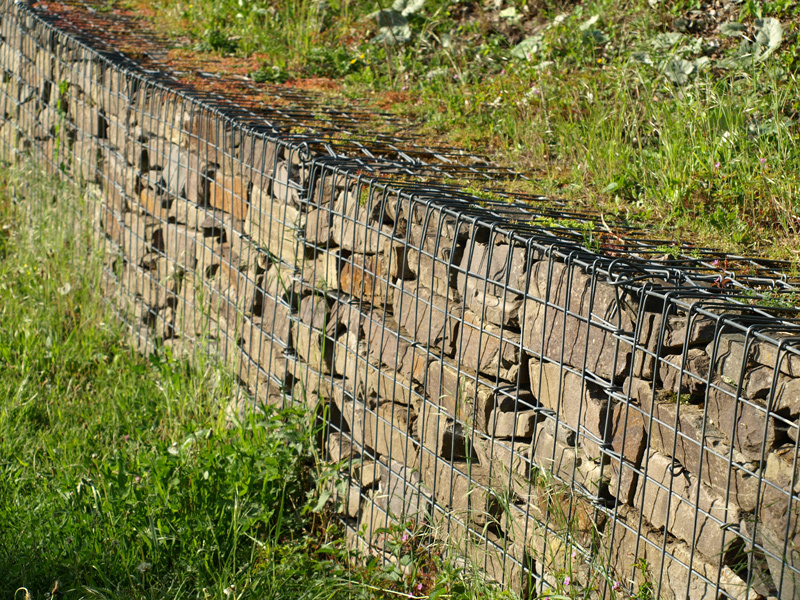 Gabion retaining walls have a life span as long as the wire used to hold them together (the wire will eventually corrode). Whichever wall system you decide is best for your project, make sure you have thoroughly evaluated the location, soil, and drainage requirements of your project. Many manufacturers have their own staff of engineers available who focus on wall design and can offer support. Additionally, online tools such as Belgard SRW Design Software 1.0 can help increase your design efficiency and turn a concept into a comprehensive design.